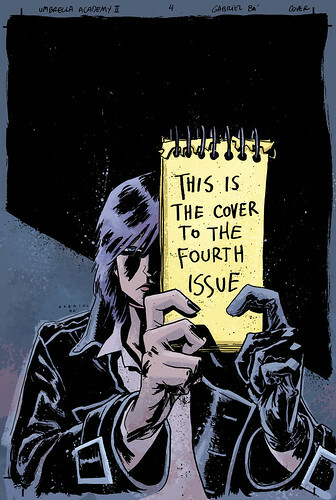 There's a preview of the fourth issue of Umbrella Academy: Dallas at the Comic Book Resources. You can check it out clicking HERE. Below is the cover (DUH!). Bá is making the best pages of his life and he's just begun drawing the last issue (as well as BPRD:1947 and God knows what else). We've been very busy and very late here, but things have never seen better. We look ahead and I gotta say this: Looks good. Yesterday at the end of the day I went to Rafa and Grampá's studio to see their current work and to meet filmaker Michel Gondry and his cartoonist son Paul, also there to visit. Talking about comics is good, but what I really enjoyed last night was talking about art in general, from street art to animation to painting to art school. It's more of a talk of what catches your attention and what makes you think than just of what you do or are planning. I drank grape juice and did this sketch. If you thought drawing the strong Spaceboy was hard, try to make the fat one. It's even harder to make it look as cool as the way Bá draws it. I had this one-page story to do and I usually draw a thumbnail and think just on the key sentences and dialogues. But I realized this one would have so much text that I needed the full text in order to see how much space I'd have left for the art. So first I wrote all the text for the story. 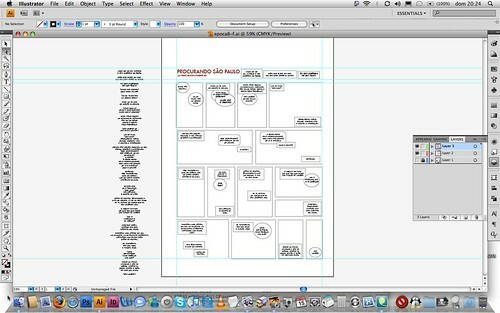 After that, I divided it in small blocks that would end up being the captions and balloons (that column on the left). Then I started laying them down on the page. At first I wanted to do big panels, some "narrative panels" only with text (just like in Casanova), but I decided it would be best for the story if I did lots of small panels, even if a little art just to make it a real comicbook, you know? I drew some panels there for guidance and now I'm gonna print this and draw on the remaining space. I really don't do it like this very often, but sometimes you gotta go with what you get. I gotta finish it by tomorrow. I'll miss the All-Star game to do it. PIXU, Buffy, and the fight. We love comics, but they can be brutal. Working against the clock, racing deadlines, juggling everything we're currently doing, nothing is easy separately and together they're particularly difficult. But that's the fight. That's the life. You can't expect everything to be easy, specially when you won't settle for the ordinary, for the most common road. You can't expect the bumpy road to come without bumps. Our dear friend Becky Cloonan was interviewed at CBR during the NYCC weekend, and she talks about two very exciting news regarding Buffy and, most importantly, our PIXU story being collected in hardcover by Dark Horse. We do our independents projects because our love for the comics world not always fits with what the publishers might want or need at the time, and we believe every good story can become a good comic. It's nice to see that sometimes our love projects can be appreciated and understood by bigger publishers, and it's great that these projects get the support and the chance to be found by a much bigger audience. Like the entire comics, the new PIXU cover was a collaboration, this time between Becky, Vasilis and me. The two individual issues of our independent limited run are still available through Khepri.com, and they contain material that won't be collected (plus they are rare, limited and the first issue is signed), and Becky will be around during the convention season selling it as well, so for those who like the specialness of our original PIXUs, you're not too late to catch on the PIXU train. Now, let's go back for another round. Our comics are looking at us fiercely. I think they want blood. De:TALES in Italian, published by Comma 22. But I want it in my hands. This doesn't feel real enough. I today ran into the script I had for the first Casanova issue I did the artwork, and on its cover page, I found this first cover doodle for the idea Bá and I were talking about.